"Seasoned chicken breasts are browned in butter and olive oil, topped with homemade guacamole and slices of pepper jack cheese, then broiled." Preheat oven broiler, and set the oven rack about 6 inches from the heat source. Heat the butter and olive oil in a skillet over medium heat, and pan-fry the chicken breasts for about 10 minutes per side until no longer pink on the inside and golden brown on the outside, sprinkling each side with Creole seasoning. Scoop the avocados into a bowl, and mash them with the lime juice, tomato, onion, garlic powder, salt, and pepper. 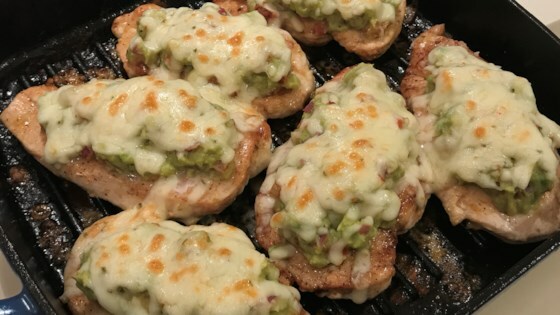 Spoon about 1/3 cup of guacamole onto each chicken breast, top with a slice of pepper jack cheese, and broil for 2 to 4 minutes, until the cheese is melted and bubbling. This was easy to prepare and turned out great. Hubby thought it was very tasty. I reduced the butter and oil which worked out fine.Otherwise, I made no changes to the recipe. Very yummy. Cut chicken into strips after it as cooked and put in a flour tortilla with refried beans.. Pretty good. The quality of the guacamole matters to this dish! I made my own guacamole and substituted the pepper jack cheese to a "Mexican" blend shredded cheese. I grilled these rather than pan frying & used monterey jack on mine(pepperjack on hubby's). We loved it & will def make again! !